If you have tried your hand at pumpkin carving, you will know that an easy Jack o Lantern design is not too difficult. But attempting more elaborate designs may make you wonder why you ever ventured away from Jack! These pumpkin carving tips will bring out the artist in any budding Halloween decorator and give you a fun decor item to share in your home. Now that summer is fading and the crisp, cool nights of autumn are with us, it’s time to think ahead to some favorite fall activities. Whether it is apple picking in order to make your favorite cinnamon baked apple recipe, getting prepared for everything pumpkin season in the kitchen, or other fun fall activities, this is the time for enjoying the fun ahead of us. Halloween is such a fun time of the year, and carving a pumpkin with friends or your children is a great activity that all will love to share in. Done incorrectly, you will have a lopsided design that rots before Halloween arrives. Done correctly, though, you will have a creation that you will happily display for all to view and admire. 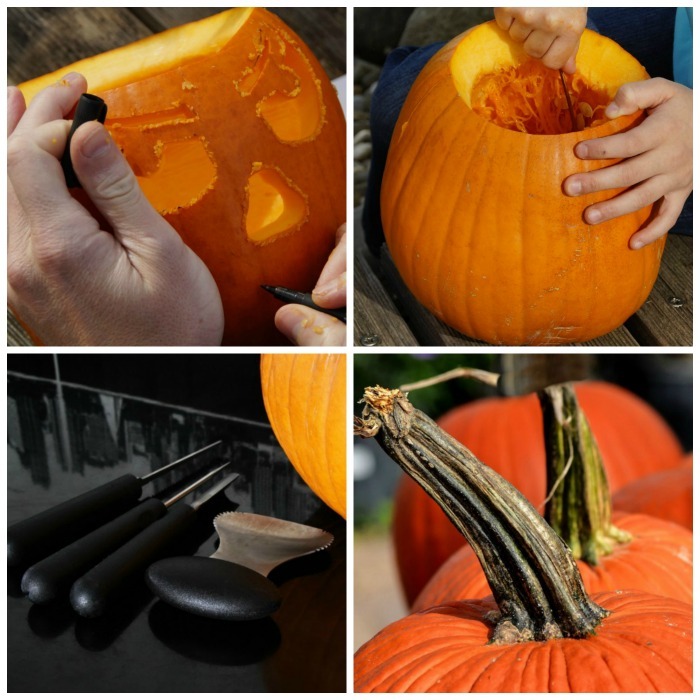 Never fear, these expert carving tricks will have your pumpkins looking and smelling good for the entire trick-or-treating season. There are a few things that you will need to know to end up with the best looking design. Check out these tips and tricks for some help. At the top of my list for carving pumpkins tips is to pick out just the right pumpkin. Make sure there are no soft spots that could indicate spoilage. 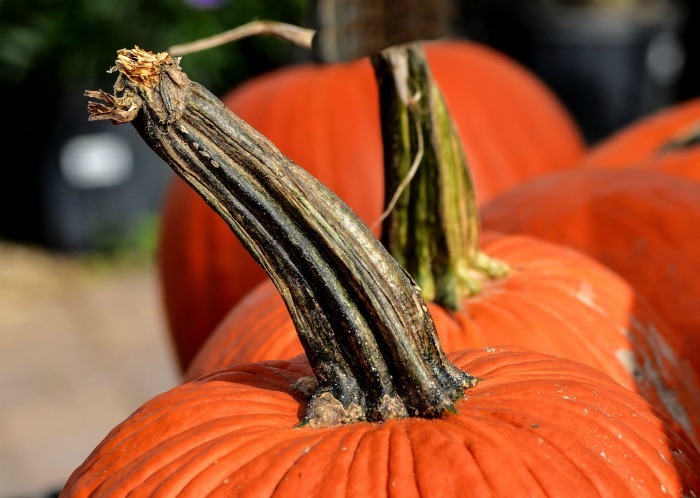 Be sure the pumpkin has a sturdy stem and try to get one that will sit flat after it is carved. This is important. If you have to cut off a piece of the bottom for it to sit straight, the pumpkin will rot more quickly. Have a flat bottom also means that the pumpkin won’t roll around while you are carving it, and this will be a big help. Another tip is to go for a big pumpkin. Those large pumpkins are easier to carve and if you are not an experienced pumpkin carver, you might find that you’ll have better luck with more room for your design. 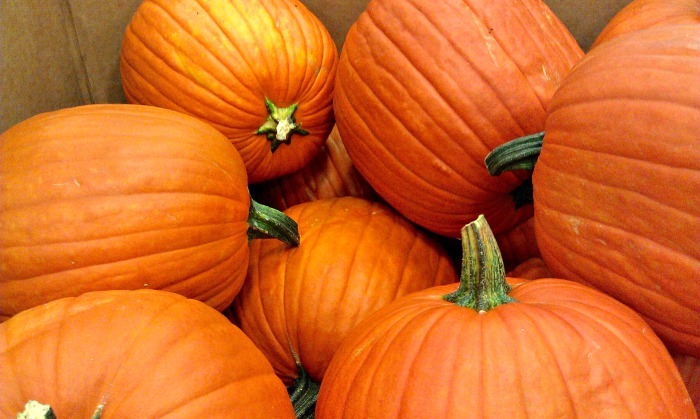 For a really fresh pumpkin, look for one which has a slightly green stem. If it has been sitting around for a long time after being picked, the stem may get brittle and dry out and will likely be more brownish looking. I’ve had the pumpkin stem come off in my hand one time while carving. Not unsurprisingly, this pumpkin did not last long when carved. 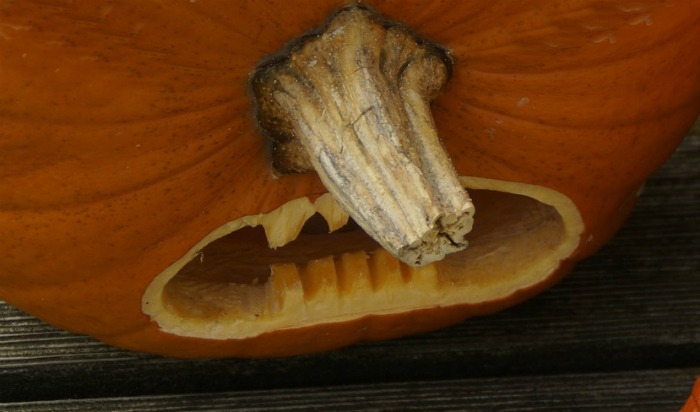 Also, if you have a pumpkin with a stem, you can get creative and use this part of it in a side ways design by using the stem as the nose of the pumpkin! 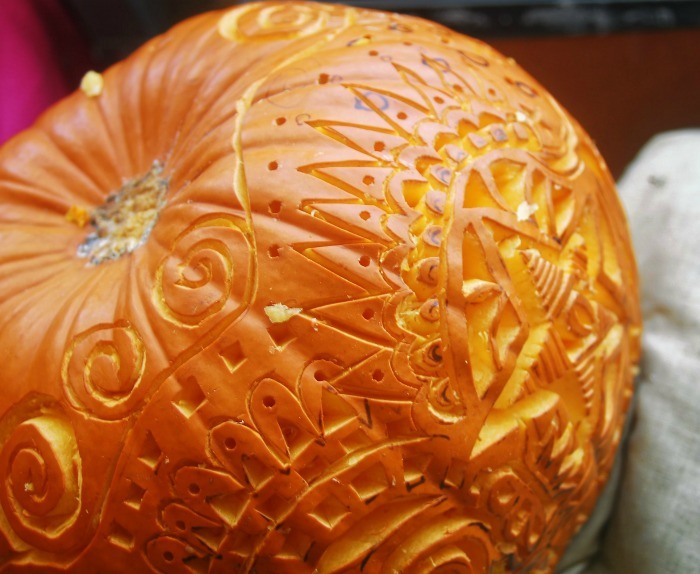 Even though some designs would indicate that a maniac pumpkin carver executed them, carving an intricate design is not as hard as you might think. You will need a few basic tools for best results though. A plain kitchen knife just won’t do. A pumpkin of the shape you want. Bigger ones are easy to work with since they have a larger surface area. A large spoon, ice cream scoop or pumpkin scraper to remove the pulp and seeds. Pumpkins will last a long time without going bad as long as you keep them whole. You can purchase one early to make sure that you get the shape you want. But once you have carved the pumpkin, it will slowly start to go bad. If you can wait until 24 hours before you wish to display the pumpkin, it will stay intact best. 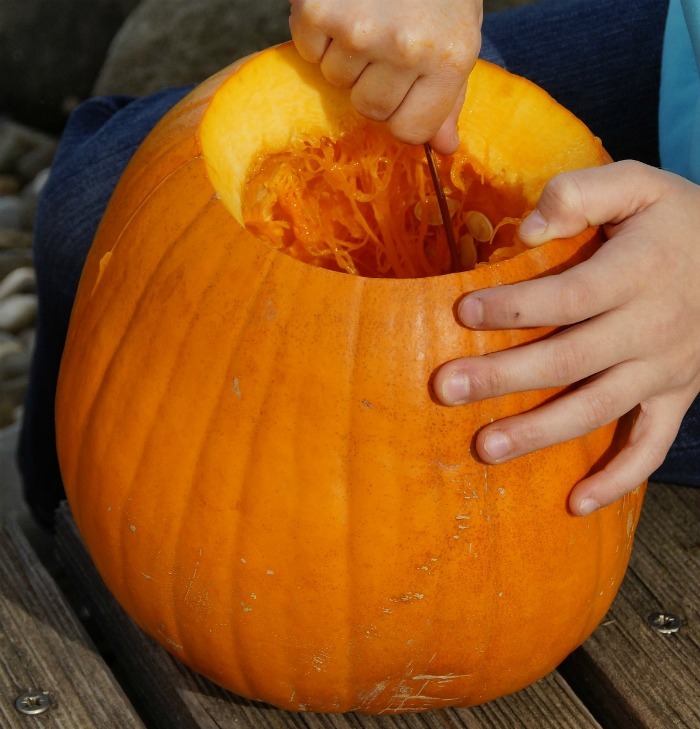 It is important to cut an opening in the top (or bottom) of your pumpkin just large enough to get your hands in to scoop out the pulp and seeds but not so large that the top will cave in later. You can make the opening round, or get fancy and use an irregular shape. 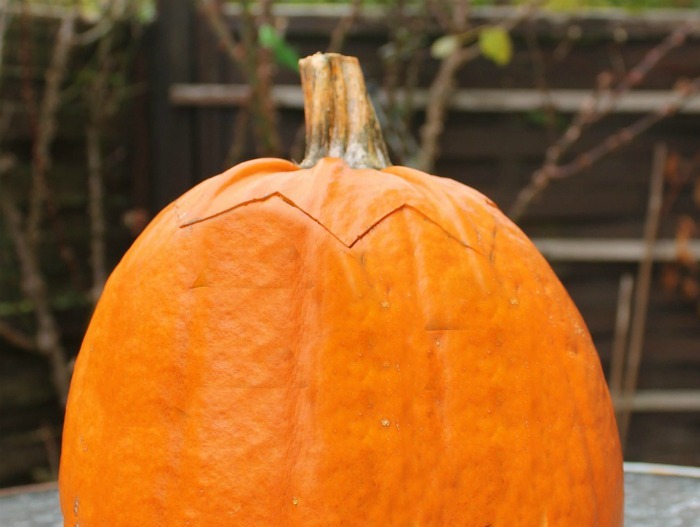 Be sure to set the top piece that you cut out to use as a lid for your finished pumpkin design. This not only completes the look but keeps the light inside the pumpkin. Using your hands and a large spoon, scoop out the pulp and seeds of the pumpkin. It’s a good idea to have some sort of container nearby, or to place the pumpkin on some newspaper so you won’t make a mess. The wall of the pumpkin should be about 1 inch thick when you are done. If you make the walls too thin, the pumpkin may rot before Halloween arrives. Thicker skins also take the heat of the candle inside better. Save the seeds to roast later. They are delicious and make a great healthy snack. Looking for a recipe to use up the seeds? Here is a great one for Toasted pumpkin seeds. It has some different varieties of seasonings for you to try. Anyone can manage a simple pumpkin face design just by keeping a tips in mind and with very few tools. 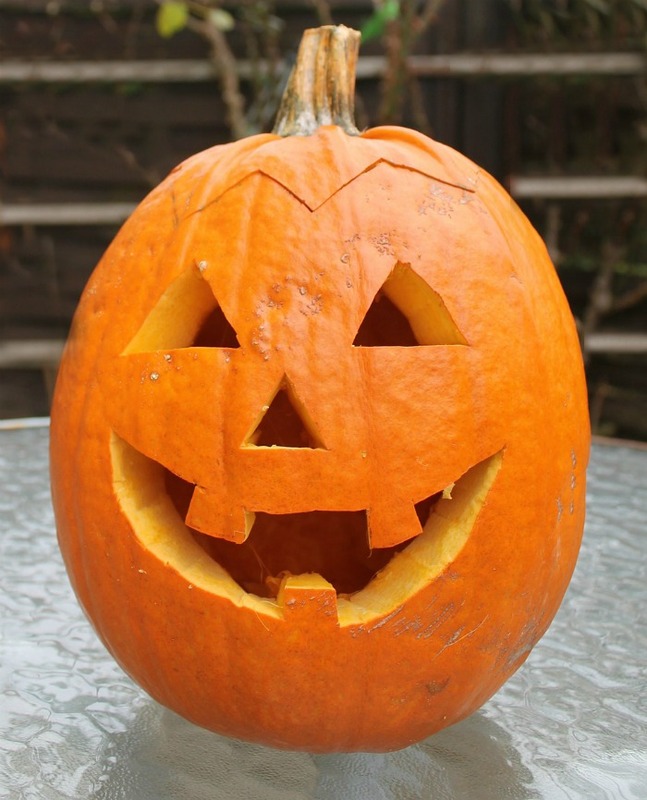 To carve a basic Jack O Lantern, all you need is a sharp knife and a simple design idea. Trace your design on the outside of the pumpkin. A plain design like triangles for a nose and eyes and a bit more elaborate mouth will work just fine or you can trace something more intricate if you re artistically inclined. Tip: a dry erase marker is better than using a sharpie pen. If you make a mistake when you trace the pattern, it will be easier to remove the mark and begin again with dry erase that with permanent marks. Once you have the design traced, use a sharp kitchen knife to cut the design from the outside to the inner area. Want something a bit more elaborate but don’t have the time or patience for a stencil? Try using a cookie cutter and a mallet to get a more intricate design. 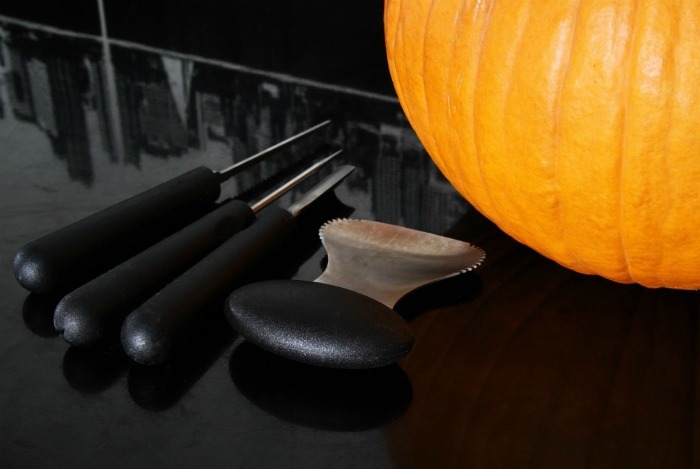 The cookie cutter will pierce the pumpkin shell with your shape and you can finish the carving with a knife. For something more elaborate than your average Jack face, there are some tools and techniques that will make the task easier. 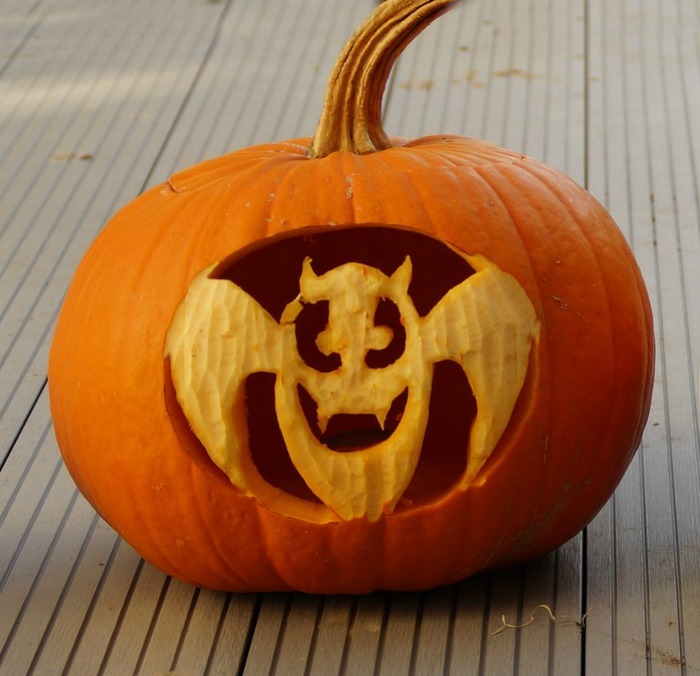 Even though you can just cut pieces out of the pumpkin to make a basic Jack O Lantern design, using a pumpkin stencil will allow you to carve pumpkins worthy of any pumpkin carving contest. 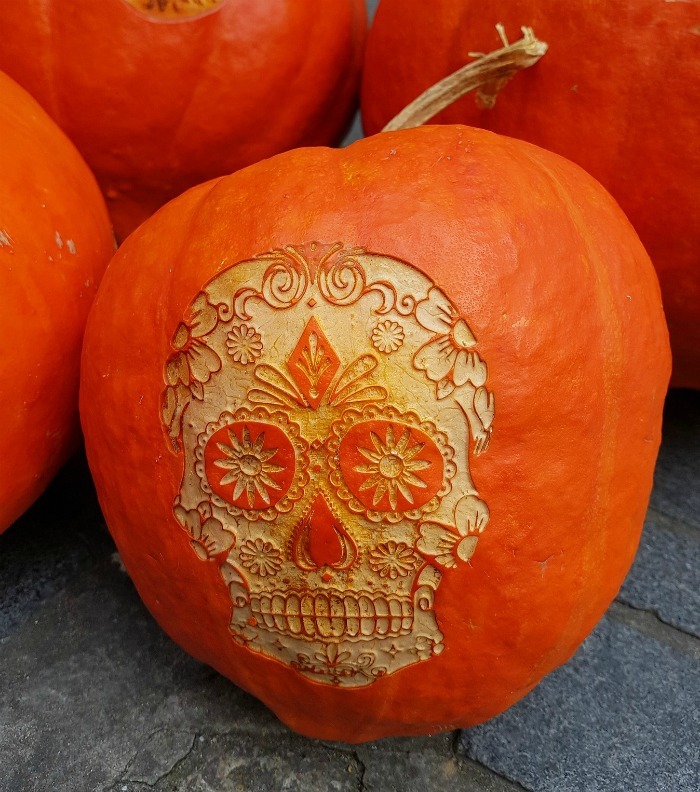 Take your stencil and tape it to the pumpkin. If it does not fit smoothly, just make small slits in it and tape it down on the pumpkin. This site has some great free stencils. 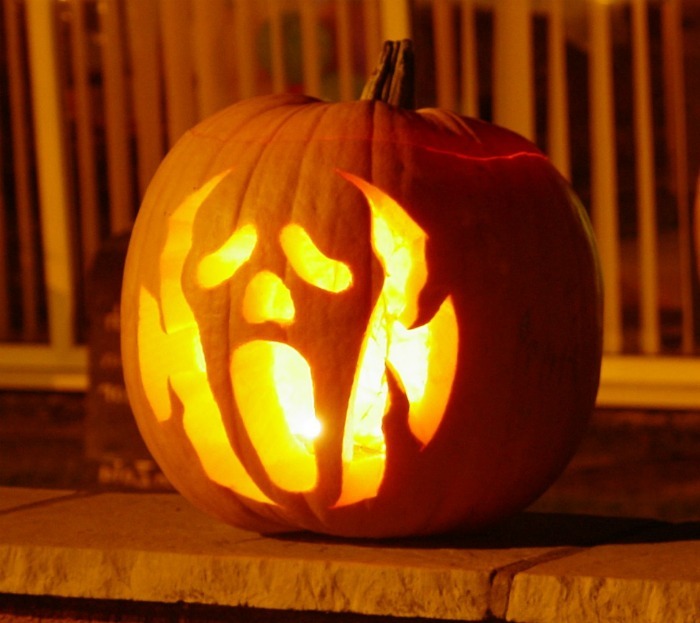 Don’t be afraid of using stencils, thinking only master pumpkin carvers can use them. Some stencils are quite simple and others are for those that don’t mind taking hours carving their creations. Don’t be afraid to get creative. 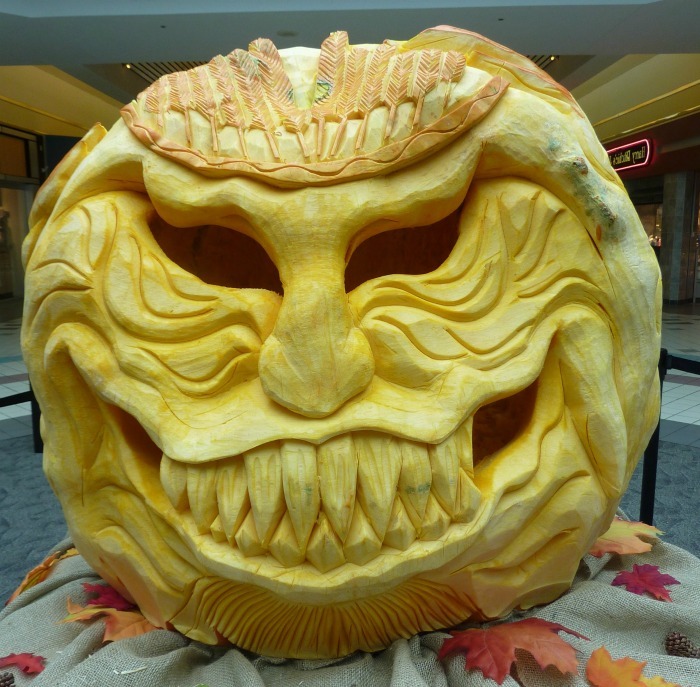 We all know how common a pumpkin with a face on it is and many people only carve this way, but you can go way beyond this in terms of creativity. Bats, ghosts, witches hats and other scenes all look great on a carved pumpkin and with stencils these are easy to do. I’ve also seen a whole pumpkin simply drilled with a holes made by a power drill and then lit from within that looked great. And who says it has to be a Halloween scene? Kids will LOVE using cookie cutters with playful characters carved into a pumpkin. Use the poker to make small holes all along the design of your pattern. Once you have done this, you can remove the pumpkin stencil and save to look at for when you start to carve the pumpkin. A drill is used to make holes through the pumpkin where the small holes that the poker makes. it will allow you to get the design through to the inside of the pumpkin. You may find this task easier if you hold the pumpkin in your lap. Once you have the design cut into the pumpkin, it is time to use a saw. Hold it like a pencil and move it up and down moving from hole to hole. Continue until your design is done. Once you have carved the pumpkin it is time to make a chimney in your pumpkin to release the heat. Without a chimney, you’ll make a mess on the inside and encourage the pumpkin to rot more quickly. Light a candle and place it inside the pumpkin and put the lid back on. In a few seconds, blow out the candle and see where the dark side is on the inside of the lid. This is the place where you will cut a small hole with your drill or a knife. When you have cut this hole, the smoke will release through it and the heat can escape the pumpkin while the candle is glowing inside. You can use simple props to turn a basic pumpkin carving into some a bit more creative. Glitter, sequins and corn stalks all change the look of a pumpkin face. 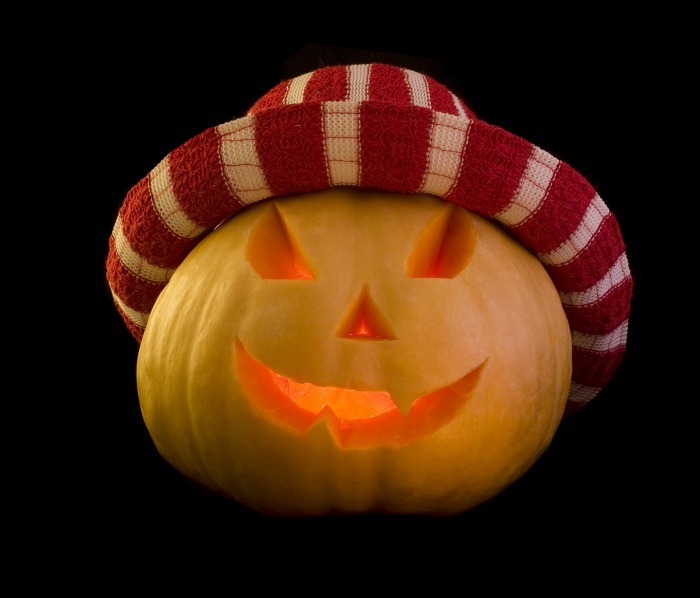 Even adding a fun hat will change a very simple carved face into a really fun design. To prevent this, use other types of light sources such as LEDs. These lights get really bright but they don’t give off a lot of heat. This will allow the pumpkin to stay cooler on the inside. We’ve all seen what happens to apples and avocados once they are cut. They go brown because of oxidation. A pumpkin won’t have this happen as quickly as these two fruits, but you will see a change if you leave it out on the counter with cuts in it. Pumpkins lose a lot of moisture while we are carving them, so pumpkin carvers know that having a water bottle handy while carving will help it to stay workable. Just spray it occasionally as you carve. When you are finished with your design, you’ll likely have some pieces of pumpkin. Don’t just throw these away! Put them to creative use. Some examples are to use them to make a tongue, or a pipe. You can also make hair pieces out of a discarded piece of pumpkin shell, for a unique look. I have covered quite a few details about pumpkin carving, but these are some common questions that I receive. How long will a carved pumpkin last? The short answer is really not that long. It depends on how open the carving is and how much air gets to it. Most pumpkins will last about 2 weeks. However if yours has less air circulating around it, you will likely start to grow moldy after a week. 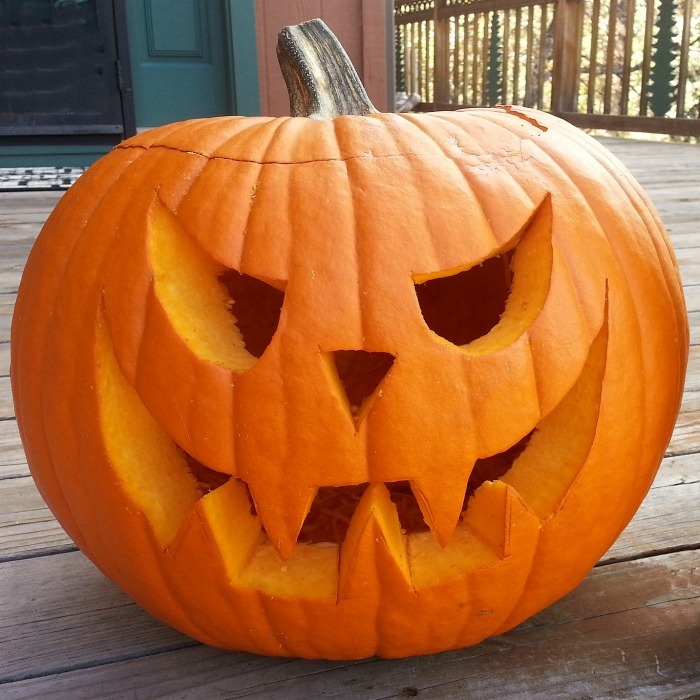 How can I keep a carved pumpkin from growing mold? Soaking the carved pumpkin in a tub of cold water will make sure that it stays hydrated. 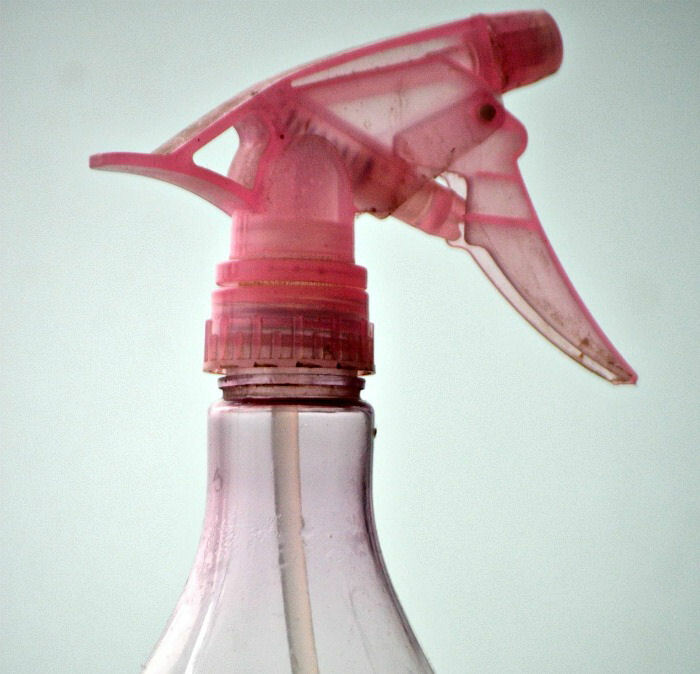 If you add a bit of bleach to the water, this will help to prevent mold. 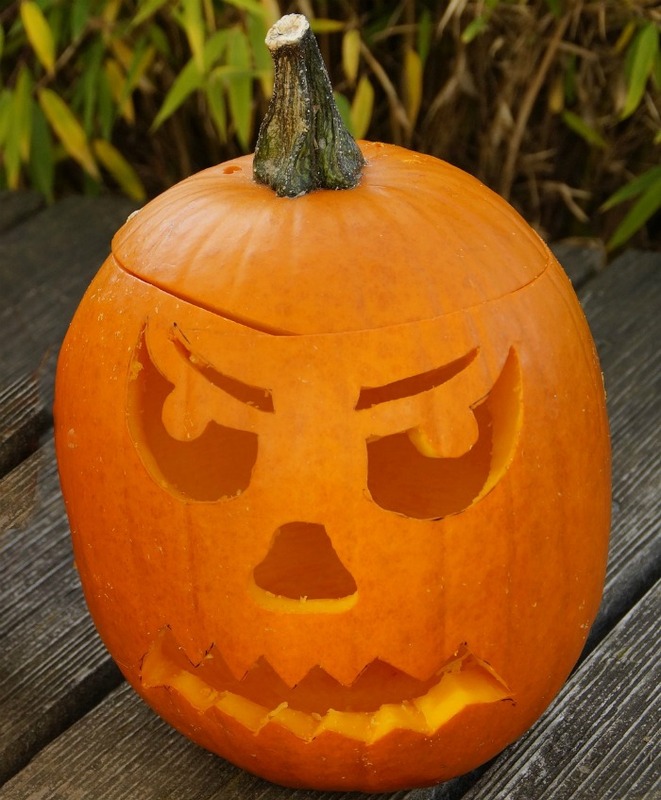 Petroleum jelly rubbed all over the edges of the carved pumpkin (both inside and out) also helps to deter mold. How long before Halloween should I carve my pumpkin? Pumpkins rot quickly as we have seen from some of the other questions and comments. 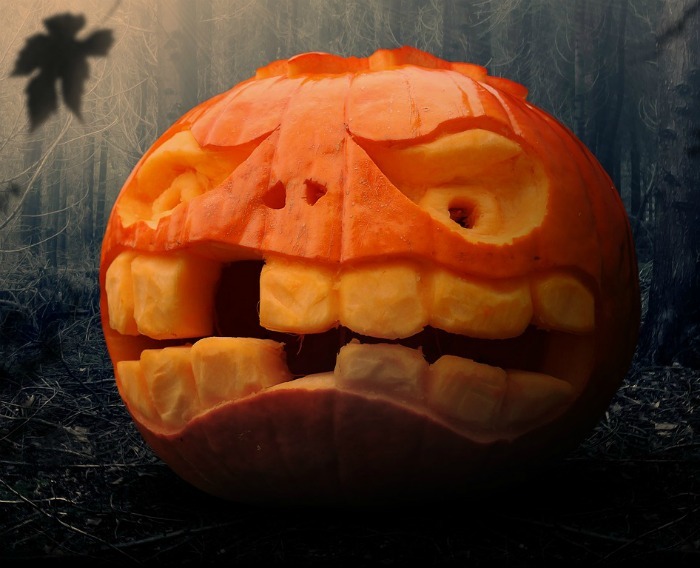 It’s a good idea to carve as closely to Halloween as you can, but no longer than 5-10 days ahead of time. If you live in a cool location, place your pumpkin outside on your porch. The cool autumn temperatures will help it last longer. Alas, here in NC, we often have warm fall days, so this won’t work for me. How do I get a nice smell in a carved pumpkin kept indoors? If you like to use a carved pumpkin indoors – perhaps on a table centerpiece, there are a few ways to keep it fragrant. Sprinkle the inside of the carved pumpkin with cinnamon, nutmeg and cloves and you’ll be able to use the pumpkin as an autumn flavored air freshener. Adding a small scented candle in a glass container as your light will also give off a nice scent. What if I can’t display my carved pumpkin right away? Nothing much will add weeks to a carved pumpkin but cold will add a few days. To prolong the life of a carved design, wrap it in plastic wrap and place it in the fridge to keep it cool. Need some inspiration for your pumpkin carving project this Halloween? Here are a few designs that might give you some ideas. Some are just a cool simple pumpkin carving and others have a much more pumpkin carving ideas that will take quite a while to carve. This fun design is eerily funny and creepy at the same time. I love the way the teeth form the focus of the design. He has a touch of the ET thing going on! Trace a cat design or use a cat cookie cutter and mallet to make this simple design that looks a bit more fancy. 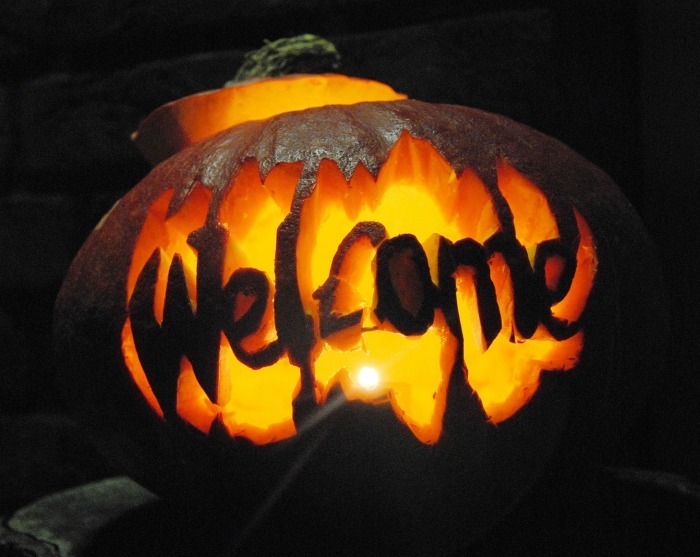 Use your carving technique to make a welcome sign for your front porch. This is thinking outside the box as its best. In this fun design, the area around the bat is first scraped of pumpkin skin and then the bat with an owlish face is carved in the scraped area for some extra dimension and detail. Who says that a pumpkin has to sit on your front porch or steps? 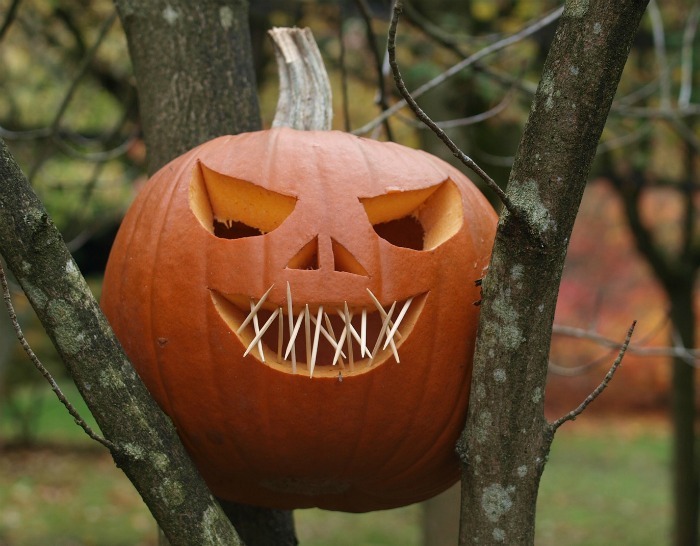 This simple design is place in a tree and toothpicks are used to make a scarier mouth area. Very little carving but very effective. Help! I’m in pumpkin jail! 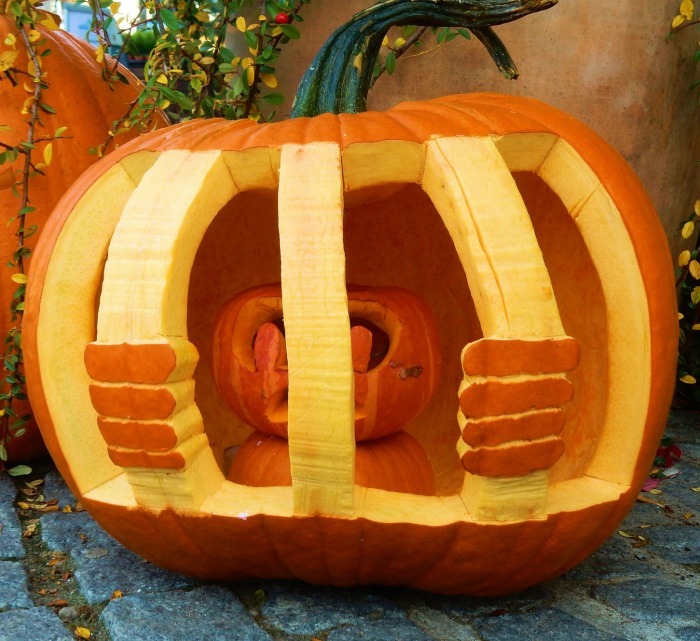 This cute design features a small carved pumpkin inside a larger pumpkins that is carved to resemble a jail cell. 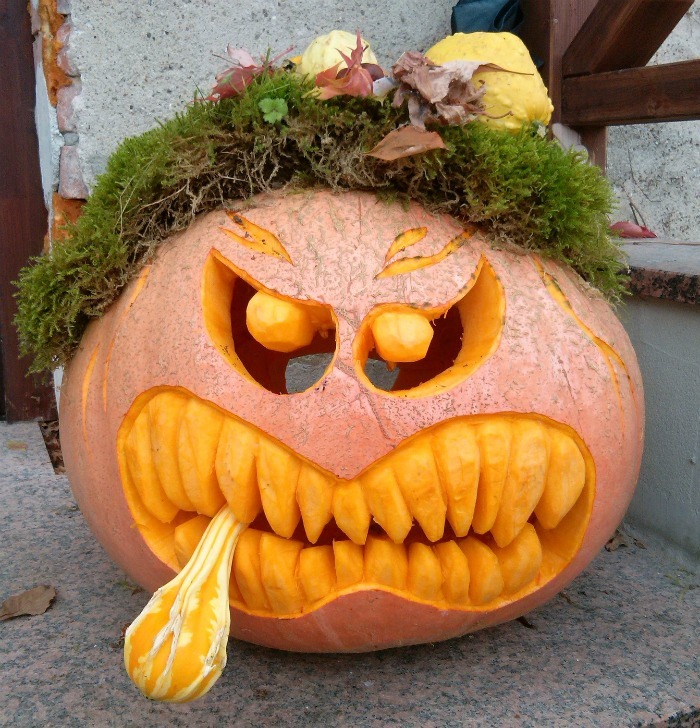 For this creative design, the pumpkin is still mainly intact. No holes are cut into the inside of the pumpkin, but the flesh has been scraped and carved very thinly. What a talent! This is one for the pumpkin carving masters! Almost the entire outside of the pumpkin has been removed, leaving the lighter colored flesh. The design looks very much like a wood carving. 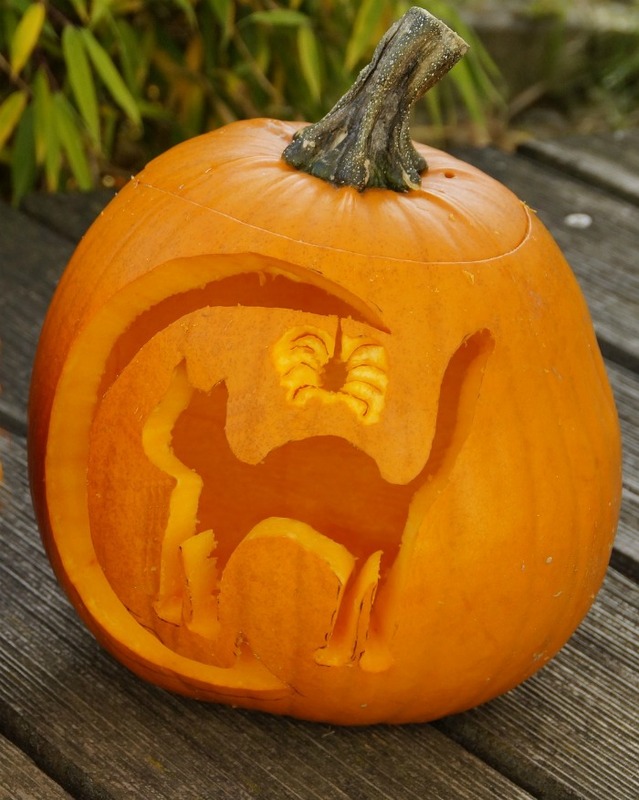 This pumpkin design is more simple than it first looks. The majority of the carving is done on the teeth, but the look is more complex, due to using the extra pieces as a tongue and also using moss and plants for hair. 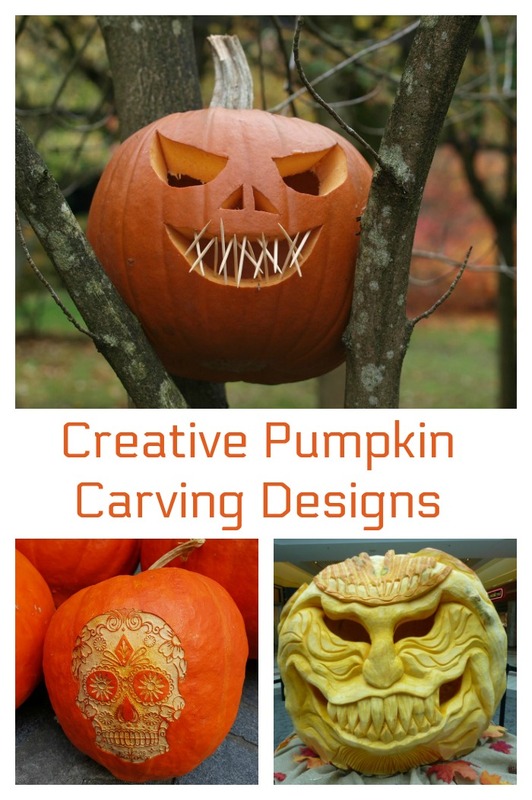 For more interesting pumpkin carving designs be sure to also check out my round up of Creative Pumpkin Carving Ideas. 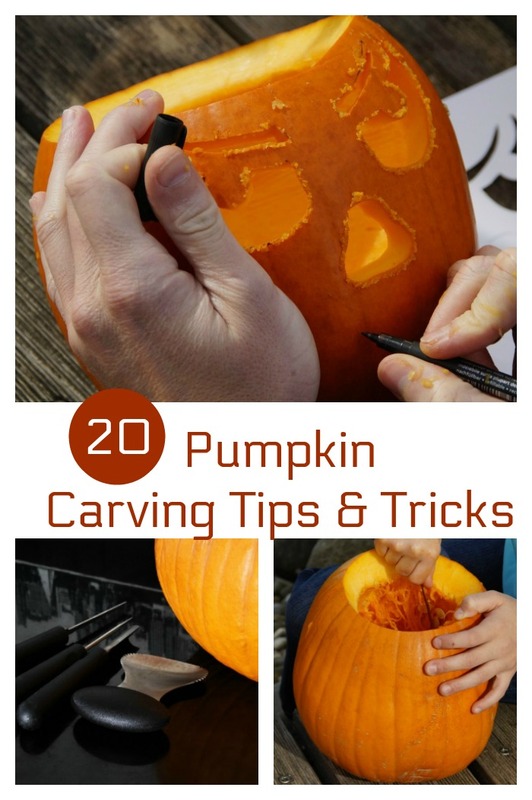 Would you like a reminder of this post on pumpkin carving tips? Just pin this image to one of your favorite Pinterest Halloween boards. Admin note: This post first appeared on my blog in October of 2015. I have updated the article to add new pumpkin carving tips, extra photos and a video for you to enjoy.